Observers hesitate to predict outcomes for Nigeria´s 2019 presidential and national assembly elections, scheduled for Saturday, Feb. 16. But there is a consensus that, with little ideological difference between the two major parties, it will depend on a host of factors varying by states in this complex federal system. This AfricaFocus Bulletin contains two analytical overview articles on the election, from November and December respectively, by Idayat Hassan of the Centre for Development and Democracy in Abuja and by Carl LeVan, of American University in Washington, DC. Both articles discuss the issues in the election, but Idayat Hassan´s analysis also dips into the electoral math at regional level, as essential for analysis of Nigerian politics as it is in the American federal system. Also included is an additional set of links to other relevant recent sources. Must-watch 6-minute video - comedy with video of Buhari at National Assembly! Idayat Hassan is director of the Centre for Democracy and Development (CDD), an Abuja-based policy advocacy and research organization with focus on deepening democracy and development in West Africa. What concerns will sway voters? Which regions will decide Nigeria’s next president? when her party switched its support to the incumbent Muhammadu Buhari. Election season is in full swing in Nigeria. In the presidential contest, we now know it will likely be a straight contest between incumbent Muhammadu Buhari of the ruling All Progressives Congress (APC) and challenger Atiku Abubakar of the People’s Democratic Party (PDP). Dozens of other candidates will be competing. 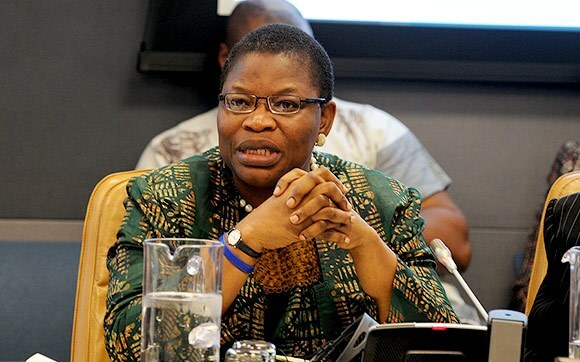 These include: Oby Ezekwesili, the former minister and founder of the Bring Back Our Girls movement; Professor Kingsley Moghalu, the former deputy governor of the Central Bank of Nigeria; and Omoyele Sowore, the owner of the media outlet Sahara Reporters. But when it comes down to it, it will be a two-horse race. This will not be the first time Buhari, 75, and Atiku, 71, have faced one another. Both men contested the 2007 presidential elections, coming a distant second and third behind the PDP’s Umaru Yar’Adua. In 2014, the two met again in the APC primaries, with Buhari emerging victorious. These past races offer little guidance, however, for how the 2019 presidential election between these two gladiators of Nigerian politics might play out. There are two ways of assessing their chances of electoral success: by looking at the main issues and where they stand on them; and by looking at the electoral maths required to win and seeing how they are each faring. First, the issues. Nigerian voters have many concerns, but for many, the key concerns are the same three that dominated the 2015 elections. In 2015, Buhari drew heavily on his reputation as incorruptible as he vowed to root out corruption. In 2019, he will undoubtedly reiterate this promise and has some things to boast about. His government claims to have recovered N1 trillion ($2.75 billion) in stolen assets. It has made giant strides in implementing the Treasury Single Account (TSA) to reduce leakages. And it has overseen the conviction of two former governors. Many, however, see President Buhari’s war on corruption as disappointing. In particular, critics accuse the government of only targeting political opponents, while allowing its cronies to go scot-free. In this campaign, though, the ruling APC has a clear advantage on this issue. The PDP is remembered for plundering the state during its previous sixteen years in power. Meanwhile, its flag-bearer, the former vice-president from 1999 to 2007, is one of the country’s richest politicians and has faced several allegations of fraud. In some circles, Atiku’s very name is synonymous with highlevel graft. Many of the fiercest accusations against the PDP candidate have come from former president Olusegun Obasanjo. After the two fell out dramatically in 2006, Obasanjo repeatedly insisted that his former deputy was corrupt and unfit for office. That was at least until a few weeks ago, when Obasanjo changed tack. It remains to be seen if this reconciliation will alleviate the heavy cloud of corruption hanging over Atiku’s head. Buhari’s main challenge in office has been the struggling economy, which plunged into recession in 2016. It has since recovered, but growth remains slow. Before Buhari took office in 2015, one US dollar bought between N199 and N220. It recently stabilised at around N360, having soared to an all-time high of N450. Given this context, Atiku is promising to revitalise the economy and emphasising his experience. Atiku has business interests across Nigeria and claims to have provided 50,000 direct jobs and 250,000 indirect jobs. He will likely talk up the fact that he oversaw the privatisation efforts under Obasanjo, though the APC may respond by claiming Atiku fraudulently enriched himself through this same process. His selection of Peter Obi, former Anambra state governor and an astute business man, as his running mate further boosts his economic credentials. Meanwhile, his related promises to restructure the federal system and devote a minimum of 21% of the budget to education may also win him some supporters. For Buhari, the economy may be a weakness. But he will also have the advantage of incumbency. His administration is currently implementing social intervention programmes said to be touching the lives of thousands. In recent months, it has also launched a collateral-free loan scheme for micro-businesses, which could win sympathies among many nationwide. In office, President Buhari has made significant progress combating Boko Haram. The insurgents previously controlled a sizeable portion of the North East, but are now a weakened force. Buhari is lauded for his actions in this area, but Atiku may also seek credit for mobilising hunters to wade off the militants in his native Adamawa. While the threat from Boko Haram may have diminished to an extent, however, insecurity pervades much of the rest of the country. Nigeria faces the escalating herders-farmers conflict, Biafra separationist agitations, armed banditry and kidnapping to name a few. Buhari has been seen to be slow to respond to many of these threats and has been accused of only caring about issues that affect his own ethnic group. Atiku can mount a serious challenge in the 2019 elections. He is up against a candidate who spent seven months in treating an undisclosed ailment and whose national approval rating is at just 40% according to Buharimeter. The PDP challenger can also rely on the full party machinery now he has won the primaries and draw on the influence of party stalwarts. Meanwhile, the formation of the opposition Coalition of United Political Parties (CUPP) means there will be fewer candidates to split the anti-APC vote. That being said, the incumbent has the advantage. In 2015, Buhari won by a significant margin of 2.5 million votes. Although his record in office has been mixed, 2019 looks like his election to lose. There are currently 84,271,832 registered voters nationwide. In 2011, Buhari got 12.2 million votes (32%) to Goodluck Jonathan’s 22.5 million (59%). In 2015, Buhari got 15.4 million votes (54%) to Jonathan’s 12.9 million (45%). 2011 results: Buhari, 6,453,437 (60.43%); Jonathan, 3,466,924 (32.46%). 2015 results: Buhari, 7,115,199 (81.34%); Jonathan, 1,352,071 (15.46%). 2019 registered voters: 20,122,934 (as at August 2018). President Buhari is adored by peasants in northern Nigeria. He is popularly referred to by them as Mai Gaskiya, which translates roughly to “trustworthy” in Hausa. According to a source, the more Buhari is criticised, the more people in the north love him. The North West, by far Nigeria’s most populous zone, is particularly strong Buhari territory. In both 2011 and 2015, he won all seven states. His approval rating here is 58%. Kano state alone has 5,462,898 registered voters (as at August 2018), making it the country’s second biggest voting bloc after Lagos. Governor Abdullahi Umar Ganduje wields extensive influence in this state and has promised Buhari a gargantuan 5 million votes in the presidential poll. The governor already delivered 2.9 million votes for Buhari in the APC’s questionable primaries. There are a couple of factors going against the APC, however. Firstly, the conduct of the APC primaries has created some discontent within the party. And secondly, former Kano governor Rabiu Kwankwaso, who helped Buhari win big in 2015, has defected to the PDP and declared his full support for Atiku. 2011 results: Buhari, 3,660,919 (63.42%); Jonathan, 1,832,651 (31.75%). 2015 results: Buhari, 2,848,678 (75.28%); Jonathan, 796,588 (21.05%). 2019 registered voters: 11,170,847 (as at August 2018). Buhari is similarly well-liked in the North East, where he is credited with suppressing Boko Haram and bringing normalcy to Adamawa, Borno and Yobe states. This zone has also benefited significantly from patronage politics under Buhari, who has recruited many of his top lieutenants from the North East. His approval rating here is 57%. Atiku is from the North East, specifically Adamawa state. He also has some important allies in the zone. In Gombe, Governor Ibrahim Hassan Dankwambo will help him win votes. And in Taraba, former minister Aisha Alhassan will also exert her influence in Atiku’s favour having recently walked out of the APC. Helped by popular frustrations at Taraba’s ongoing insecurity, Alhassan’s extensive influence means she is likely to help maintain the PDP’s record of winning this state. However, Atiku faces an uphill battle everywhere else in a zone that voted overwhelming for Buhari in 2015. 2011 results: Buhari, 1,744,575 (31.87%); Jonathan, 3,376,570 (61.69%). 2015 results: Buhari, 2,411,013 (56.24%); Jonathan, 1,715,818 (40.03%). 2019 registered voters: 13,333,435 (as at August 2018). The North Central zone is traditionally Nigeria’s swing region. In 2011, Buhari only won in Niger state. In 2015, he won four states – Kwara, Kogi, Benue and Niger – and lost in relatively close races in Plateau, Nasarawa and the Federal Capital Territory (FCT) Abuja. In 2019, Buhari may find it harder going than the last time. Many people are unhappy with the government’s response to herder-farmer clashes, which have ravaged Plateau and Benue states in particular. Meanwhile, political realignments in several states could make things tough for Buhari. Two defections to the PDP stand out in particular: Bukola Saraki, the Senate President and former Kwara governor; and Samuel Ortom, governor of Benue. Their switches of allegiance could make this zone more competitive. 2011 results: Buhari, 321,609 (7.05%); Jonathan, 2,836,417 (62.22%). 2015 results: Buhari, 2,433,122 (53.6%); Jonathan, 1,821,416 (40.12%). 2019 registered voters: 16,341,312 (as at August 2018). The South West will be closely fought. In 2015, the PDP only won one of the six states here, but still managed to get 40.12% of the vote. Some believe the APC will do better in 2019 than in the last elections. This is in part thanks to Buhari’s decision to posthumously honour MKO Abiola, the winner of the annulled 1993 presidential elections, and move Democracy Day to the 12 June, the date of that vote. Abiola, who grew up in Ogun state, is still celebrated in the South West and around Nigeria. Buhari is also aided by the fact the APC can draw on the influence of all six governors in the South West, the prominent former Lagos governor Bola Tinubu, and his Ogun-born vice-president Yemi Osinbajo. Some factors could undermine the party’s fortunes, however. The APC primaries have created some disgruntled figures. Many voters see the administration’s performance in the past few years as lacklustre. And the powerful church could yet play a significant and thus far unclear role. The huge Redeemed Christian Church of God in Lagos may back Osinbajo, which would consolidate support for Buhari. But others like televangelist Tunde Bakare, who first publicly announced the candidature of Oby Ezekwisili, could encourage voters to support her, potentially drawing votes away from the leading candidates. 2011 results: Buhari, 20,335 (0.40%); Jonathan, 4,985,246 (98.69%). 2015 results: Buhari, 198,248 (7.04%); Jonathan, 2,464,906 (87.55%). 2019 registered voters: 10,154,748 (as at August 2018). The APC and Buhari brands play poorly in the South East and they are even less popular following their handling of the Biafra secessionist movement. Many in the South East believe the region is marginalised, and the Indigenous People of Biafra (IPOB) has been agitating for independence in the past few years. The government has responded heavy-handedly with clampdowns and arrests. All this means that the PDP is likely to do very well here once again. The fact that Atiku picked Peter Obi, a former Anambra governor, as his running mate will further attract support. The downside for the PDP is that the South East is the zone with the fewest registered voters, accounting for just 12.04% of the nationwide total. Turnout also tends be low. In 2015, it was just 39% in this region, and it could remain low especially with IPOB calling on supporters to boycott all elections until the government agrees to hold a referendum on independence. 2011 results: Buhari, 49,978 (0.79%); Jonathan, 6,128,963 (96.92%). 2015 results: Buhari, 418,890 (7.96%); Jonathan, 4,714,725 (89.66%). 2019 registered voters: 13,148,556 (as at August 2018). The South South will also largely back the PDP as it did overwhelmingly in 2011 and 2015. The region – and in particular the populous Rivers state – will likely be a vote bank for Atiku. In these efforts, the party will be aided by Nyesom Wike, the Rivers state governor, a powerful PDP mobiliser. Buhari will not mount a serious challenge to Atiku in the South South. But he might expect his meagre 7.96% vote share from 2015 to increase following the defections of two former governors – Akwa Ibom’s Godswill Akpabio and Delta’s Emmanuel Uduaghan – to the APC. The final list of presidential candidates, released by the Independent National Electoral Commission on Jan. 19, 2019 came to a total of 73. Report, in collaboration with the Nigeria Labour Congress, on the impact of Boko Haram on North-East Nigeria, and how education and health workers are the key to sustainable recovery. 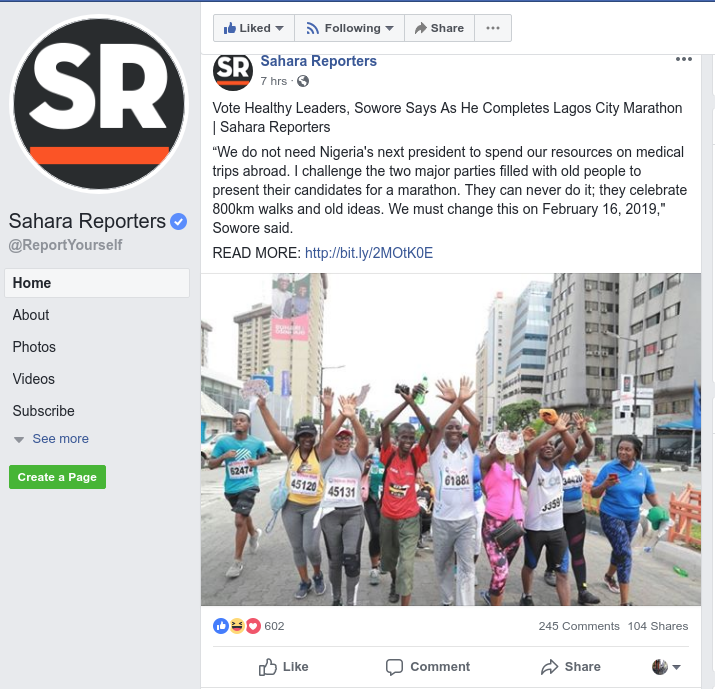 At left: Presidential candidate Omoyole Sowore completes Lagos City Marathon two weeks before elections. I found that insecurity, and specifically concern about Boko Haram-related violence, ranked high among citizens' minds in the two years or so before the 2015 election. But Buhari's All Progressive Congress (APC) won on a platform that emphasized economic growth, anticorruption, and electoral integrity. Through a content analysis of 929 coded references, I found that the APC and the then-incumbent People's Democratic Party (PDP) systematically emphasized different issues. One unexpected finding concerned the "non-issues" that the PDP talked about: the party barons were more likely to campaign by attending funerals, weddings, and parties. The PDP also failed to capitalize on some of its strengths, including gender and some modest improvements for women during President Goodluck Jonathan's tenure. The APC mentioned such "social issues" twice as much, despite Buhari's outdated views on women. These findings are important because they demonstrate that there were substantive differences between what Nigeria's parties talked about in 2015. While these differences might not amount to the ideological contrasts nostalgically recalled from postindependence era, it does suggest that issues and party platforms are starting to matter. My statistical analysis of survey data shows that President Jonathan's team sought to mobilize the party's base by cultivating political polarization on the issue of insecurity. In the end, poorer, more economically pessimistic voters rallied to Buhari. I found that citizens' evaluation of past economic performance, self-reported level of wealth, and expectations for which party would improve the economy, all strongly correlated with voting intentions in 2015. In such situations, the classic African story is for politicians to turn to social cleavages to mobilize voters. In 2015, I found that religion predicted Nigerians' voting preferences even more reliably than ethnicity. Specifically, an individual's selfidentification as a Muslim corresponded with a nearly 56 percent decline in support for Goodluck Jonathan, the incumbent, Christian president from the south. Anti-corruption remains Buhari's strongest card to play. Two former governors, Joshua Dariye and Jolly Nyame have both been sentenced. While corruption investigations are common and allegations are an impulsive political habit, convictions of highlevel officials are very rare. However, such a message has been contaminated by Buhari's credibility gap in other areas. As President Jonathan learned with the #BringBackOurGirls movement, mishandling one policy area results in reputational spillover to other areas. President Buhari recently had to offer a "proof of life" in response to bizarre allegations flooding social media that he was no longer alive and the government was using a body double. This appears intended to cynically evoke memories of President Umaru Musa Yar'Adua's long absence from public view due to poor health in 2010. Buhari also left the country for seven weeks to receive medical treatment. More importantly, Buhari's administration has often misled the public about progress against Boko Haram. Most recently, the military very publicly disputed casualty figures in recent battles, since larger losses by the Army would imply that the insurgency remains deadly – and Buhari has not lived up to his 2015 campaign promises. The Islamic State West Africa's Province (ISWAP) currently claims to control areas such as Buni Gari, and apparently the military did not successfully re-take the towns of Arge and Kangarwa.